Running in Heels – By Emily H.
I heard this phrase no less than 7 times during the Running o’ the Green this year. That’s one time for each kilometer I ran (which equates to almost 2 times per mile). Those of us with physical disabilities who participate in athletic activities often have to grapple with the whole idea of “being an inspiration.” When we go out and run road races or climb mountains, other people believe us to be inspirational just because we’re able to do these things that millions of other people do “in spite of” our disabilities. To us, this can sometimes translate to feeling as though we’re defined by our disability. It makes it seem as though our disability is something we’ve had to overcome in order to achieve our goals. I think this is part of why being called an inspiration by a total stranger has often bothered me in the past. I’m just living my life in a way that’s normal for me and I don’t deserve to be called an inspiration just because of that. … and yet I can’t deny the fact that my disability impacts me. People often ask me what it feels like to wear a prosthetic leg. The best analogy I’ve been able to come up with is that it’s similar to wearing high-heeled shoes. Regardless of how well your heels fit, or how comfortable they seem when you put them on in the morning, you’re absolutely ready to get them off your feet at the end of the day. I don’t know about you, but I’ve never seen anyone run a distance race in heels. 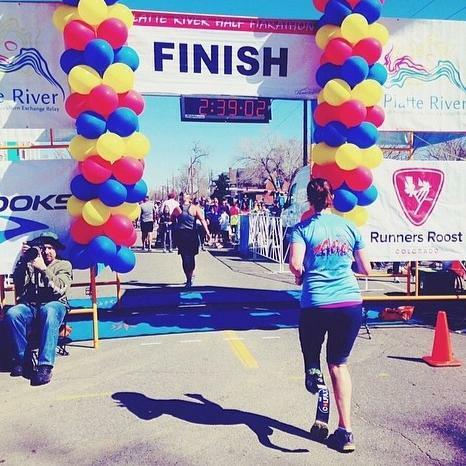 Can you imagine how your feet would be screaming at you after 13.1 miles of that? After all, there’s a reason bridesmaids always end up barefoot at weddings. Two days ago, I participated in my first half marathon. I’d spent months training for it and my goal was to do it in under 2 ½ hours. I got to mile 6 in 1 hour and 2 minutes – I was on pace to finish well under my goal. I crossed the finish line in 2 hours, 35 minutes, and 20 seconds. I made a beeline to the nearest clear patch of pavement, sat down, and ripped my prosthesis off as quickly as I could. My residual limb shook uncontrollably and my knee was red, but I did it. I finished a half marathon. My disability does not define me, but it can make some activities more difficult. It took struggling through a half marathon and a shoe analogy, but I think I’m finally at peace with being called an inspiration solely on the basis of the fact that I’m a runner who also happens to be missing a limb.